What is it about sickness or death that brings out the worst in family members? It seems that people who normally love each other often turn into people we don’t recognize as soon as a loved one is seriously ill. Everyone wants to be in control. No one trusts anyone else to do the right thing for the person who is ill and could possibly die. Of course, in the case of a married couple, it’s usually easy: each spouse makes decisions for the other if one is not able to make decisions for himself. But that can be quite different if the ill person is in control of his/her faculties and able to speak for himself. Sometimes, a relative – sister, brother, mother or father – will step in and persuade their child or sibling to do things his/her way, leaving the spouse out altogether. This causes hostility and the family quarrel begins. So what happens? Nothing good! 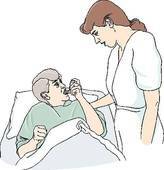 This usually results in the unhappiness of everyone involved, especially the sick person. He feels as if he's being pulled in two directions. Does he let his spouse be his “next of kin,” as it should be, and help him handle his medical affairs, or does he turn his back on his loving spouse and let his “blood” family influence his decisions? Either way, the most important person in this scenario is unhappy and feels guilty for causing someone he loves to feel left out. This unhappiness and guilt could make the difference in how quickly the person gets well - or if he does! It's a well-known fact that recovery is hastened - or hindered - by the sick person's attitude. A cheerful person will recover much more quickly than a person who is sad or depressed. The outcome depends on the consciences of those involved. There is only one right way and there is no substitute for “right.” There are always consequences for treating others badly. And sometimes the consequences are terrible! Oh yes. Been there done that. You said it very well. I couldn't agree more as I have witnessed this on a personal level too many times. Relatives can be truly shocking is all I can say! Good post. This needed to be said.